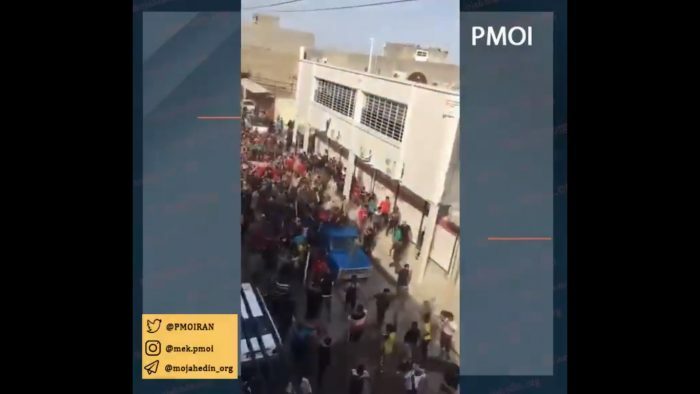 Locals in Ahvaz, capital of Khuzestan province, take it to the street to protest the inaction and lack of aid from the government institutes despite the devastating situation of the flood-hit areas. Angry locals in Ahvaz took to the streets on Friday to demonstrate the regime’s lack of action following widespread flooding. 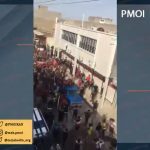 Videos published through MEK network shows protestors gathered in Eyn-e Do, western Ahvaz. Protestors chanted, “they wanted to dishonor us, but we will not be dishonored.” The regime opened dams which allowed floodwaters to wash over their farmland, homes, and businesses. The local population had limited resources and were unable to make flood barriers to protect their assets and livelihoods. The protestors demanded that the regime redirect the water into Hawizeh Marshes to alleviate the flooding. The regime is refusing to do so to protect its oil interests in the area. Locals have had to rely on community-led projects for assistance. The state-run media outlets falsely reported that the regime has provided assistance to local communities. However, this has not been the case. The regime has not used the many boats, helicopters, warehouses, shelters and other resources at its disposal to help the victims. Instead, it has used its Basij forces and IRGC to stifle protests and political dissent. The regime has not even acknowledged the more than 200 Iranians that have lost their lives in the flooding. They remain ardent that the death count is far lower. If the regime will not even acknowledge the full extent of the damage, then it will not make the necessary arrangements to help with the cleanup, rescue, and housing of all the flood’s victims. The Iranian opposition, the People’s Mujahedin Organisation of Iran (MEK), also revealed that the regime’s mismanagement was responsible for exacerbating the flood damage. This was echoed by the country’s Inspection Organization. Naser Saraj, the organization’s head asserted that “mistakes and man-made elements” has contributed to the damage and loss of life. The regime failed to adequately dredge the draining system left Ahvaz and other towns and cities vulnerable to flooding. This, coupled with unmitigated construction in areas prone to flooding, led to swathes of Ahvaz and Khuzestan province being submerged in the muddy floodwaters. The regime must be held responsible, both for its incompetence, and its inadequate response to the flooding.